We are cheating by doing our apricot picking and summer pruning at the same time. 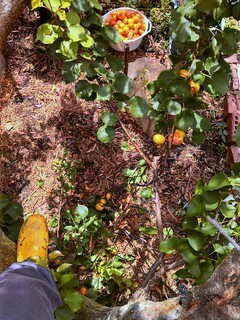 trimming a branch and picking the fruit off. The fruit on this tree is a lot firmer (Trevatt or Tilton? ), but we know when it is ripe because the wattlebirds start crashing around in the tall branches. This apricot tree used to sit next to the old chook shed, so it has a legacy of rich soil (we moved the chooks not the tree). Each year it tries to double it’s size. So it is a good thing it is easy to climb. We’ve picked over 10 kilos of fruit this weekend, some is bottled already, with more waiting for preserving tomorrow. And I think I’ve eaten about 5 kilos of the fruit in the past two weeks. 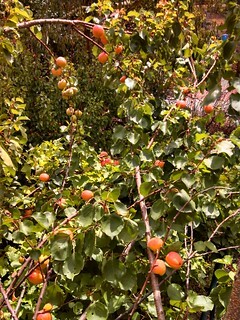 While the rest of the vegies are looking pathetic from the hot and overly dry weather, the apricot and other fruit trees have tapped deep down and are making delicious juicy fruit. Mother Nature at her best. I’d cast a spell for rain if I could. Deep soaking rain to seep into the subsoil. This morning I disturbed a wallaby actually in our backyard. Before I realised it was a total fire ban I’d turned on a sprinkler in the front yard and noticed some wallaby poo. Not too unusual given we sometimes leave our front gate open, and the wallabies are becoming more frequent visitors to the nature strips. Most unusual was the wallaby poo near the water tap in the backyard. Which is when I started looking around. Milly cat and I spooked the poor wallaby under the natives at the side of the house and I decided to open the front gates and hope it headed that way. Zac snapped a photo near some of the fruit trees before it left us. It was only a small one and its slightly dishevelled coat might have been the source of some tufts of fur lying on a garden path earlier in the week. Milly cat was much more in hunting mode than I’d expect when you consider the scale of a wallaby vs a cat. So I was glad it made it’s way up through the berry patch and out the front. We really need some rain to replenish not just our suburban garden but also the bush in the reserve up the valley. It must be very slim pickings up there. PS: I also discovered a couple of draft posts about our meat smoking and curing adventures in November, will add photos and publish soon.